A fixed-wing aircraft, commonly called an airplane or aeroplane, (from the Greek: aéros- "air" and -planos "wandering") and often shortened to plane, is a heavier-than-air craft in which movement of the wings is not used to generate lift. The term is used to distinguish airplanes from rotary-wing aircraft, where the movement of the wing-surfaces generates lift. Fixed-wing aircraft include a large range of craft from small trainers and recreational aircraft, to large airliners and military cargo aircraft. The term also embraces aircraft with folding wings that are intended to fold when on the ground. This is usually to facilitate storage or transport. It also applies to "variable geometry" aircraft, such as the General Dynamics F-111, the Grumman F-14 Tomcat, and the Panavia Tornado, all of which can vary the sweep angle of their wings during flight. There are also rare examples of aircraft which can vary the angle of incidence of their wings in flight, such the F-8 Crusader, which are also considered to be "fixed-wing." Some aircraft use fixed wings to provide lift only part of the time, and may or may not be referred to as fixed-wing. Two necessities for all fixed-wing aircraft are air flow over the wings for lifting of the aircraft and an open area for landing. The majority of aircraft, however, also need an airport with the infrastructure for maintenance, restocking, refueling, and the loading and unloading of crew, cargo, and/or passengers. While the vast majority of aircraft land and take off on land, some are capable of taking off and landing on aircraft carriers, ice, snow, and calm water. The aircraft is the second fastest method of transport, after the rocket. Commercial jet aircraft can reach up to 559 miles per hour. Single-engined aircraft are capable of reaching 109 miles per hour or more at cruise speed. Supersonic aircraft can reach speeds faster than sound. The speed record for a plane powered by an air-breathing engine is currently held by the experimental NASA X-43, which reached nearly ten times the speed of sound. The biggest aircraft currently in service is the Antonov An-225 (Ukrainian), while the fastest currently in production is the Mikoyan MiG-31 (Russian). The biggest supersonic jet ever produced and currently in service is the Tupolev-160 (Soviet design). Gliders or sailplanes are aircraft designed for unpowered flight. Most gliders are intended for use in the sport of gliding and have high aerodynamic efficiency: Lift-to-drag ratios may exceed 70 to 1. The energy for sustained gliding flight must be obtained through the skillful exploitation of naturally occurring air movements in the atmosphere. Glider flights of thousands of miles at average speeds over 109 per hour have been achieved. Military gliders have been used in war for delivery of assault troops, and specialized gliders have been used in atmospheric and aerodynamic research. 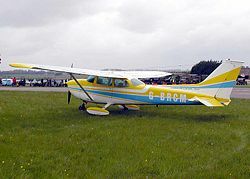 Motor gliders equipped with engines (often retractable), some capable of self-launching, are becoming increasingly common. Smaller and older propeller aircraft make use of reciprocating internal combustion engines that turn a propeller to create thrust. They are quieter than jet aircraft but they fly at lower speeds and have lower load capacity compared to similar sized jet powered aircraft. However, they are significantly cheaper and much more economical than jets, and are generally the best option for people who need to transport a few passengers and/or small amounts of cargo. 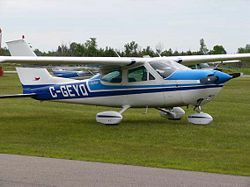 They are also the aircraft of choice for pilots who wish to own an aircraft. Turboprop aircraft are a halfway point between propeller and jet: They use a turbine engine similar to a jet to turn propellers. These aircraft are popular with commuter and regional airlines, as they tend to be more economic on shorter journeys. First developed in England and Germany in 1931, jet aircraft make use of turbines to create thrust. These engines are much more powerful than a reciprocating engine. As a consequence, they have greater weight capacity and fly faster than propeller-driven aircraft. One drawback, however, is that they are noisy; this makes jet aircraft a source of noise pollution. However, turbofan jet engines are quieter, and they have seen widespread use partly for that reason. Jet aircraft possess high cruising speeds (300 to 400 mph) and high speeds for take-off and landing (93 to 155 mph). Due to the speed needed for takeoff and landing, jet aircraft make use of flaps and leading edge devices for the control of lift and speed, and have engine reversers (or thrust reversers) to direct the airflow forward, slowing down the aircraft upon landing, in concert with the wheel brakes. Wide-body aircraft, such as the Airbus A340 (French) and Boeing 777 (U.S.), can carry hundreds of passengers and several tons of cargo and are able to travel for distances up to 10,563 miles. 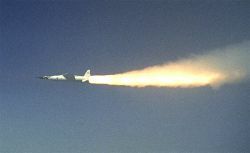 Supersonic aircraft, such as military fighters and bombers, the Concorde (French), and others, make use of special turbines (often utilizing afterburners), that generate the huge amounts of power needed for flight at faster than the speed of the sound. The design problems for supersonic aircraft are substantially different than those for subsonic aircraft. Flight at supersonic speed creates more noise than flight at subsonic speeds, due to the phenomenon of sonic booms. This limits supersonic flights to areas of low population density or open ocean. When approaching an area of heavier population density, supersonic aircraft are obliged to fly at subsonic speed. Due to the high costs, limited areas of use and low demand, supersonic aircraft are no longer used by major airlines. Experimental rocket-powered aircraft were developed by the Germans as early as World War II, although they were never mass produced by any power during that war. The first fixed-wing aircraft to break the sound barrier in level flight was the rocket-powered Bell X-1 (U.S.). The later North American X-15 (U.S.) was another important rocket plane that broke many speed and altitude records and laid much of the groundwork for later aircraft and spacecraft design. Rocket aircraft are not in common usage today, although rocket-assisted takeoffs are used for some military aircraft. SpaceShipOne is the most famous current rocket aircraft, being the test vehicle for developing a commercial sub-orbital passenger service; another rocket plane is the XCOR EZ-Rocket; and there is of course NASA's Space Shuttle. The history of surface-launched, supersonic ramjet vehicles began in 1944 at the request of the U.S. Navy's Bureau of Ordnance. In a ramjet, is produced by passing the hot exhaust from the combustion of fuel through a nozzle. The nozzle accelerates the flow and produces thrust. To maintain the flow through the nozzle, high pressure combustion is needed, which is accomplished by "ramming" external air into the combustor, using the forward speed of the vehicle. Scramjet is an short name for Supersonic Combustion Ramjet. The scramjet differs from the ramjet in that combustion takes place at supersonic velocities through the engine. It is mechanically simple, but vastly more complex aerodynamically than a jet engine. Hydrogen is normally the fuel used. Both ramjet and scramjet aircraft are mostly in the experimental stage. The dream of flight goes back to the days of pre-history. Many stories from antiquity involve flight, such as the Greek legend of Icarus and Daedalus. Leonardo da Vinci drew an aircraft in the fifteenth century. With the first flight made by man (Francois Pilatre de Rozier and Francois d'Arlandes) in an aircraft lighter than air, a balloon, the biggest challenge became to create other craft, capable of controlled flight. Sir George Cayley, the inventor of the science of aerodynamics, was building and flying models of fixed-wing aircraft as early as 1803, and he built a successful passenger-carrying glider in 1853. In 1856, Frenchman Jean-Marie Le Bris made the first powered flight, by having his glider "L'Albatros artificiel" pulled by a horse on a beach. On August 28, 1883, the American John J. Montgomery made a controlled flight in a glider. 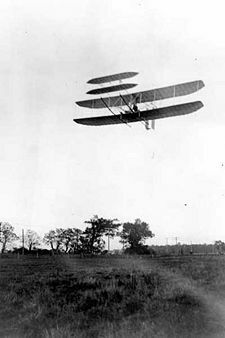 Other aviators who had made similar flights at that time were Otto Lilienthal, Percy Pilcher, and Octave Chanute. 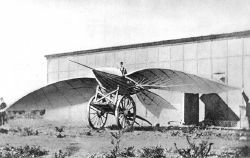 Self-powered aircraft were designed and constructed by Clément Ader. On October 9, 1890, Ader attempted to fly the Éole, which succeeded in taking off and flying a distance of approximately 164 feet before witnesses. In August 1892, Ader's Avion II flew for a distance of 656 feet, and on October 14, 1897, Avion III flew a distance of more than 984 feet. Richard Pearse made a poorly documented, uncontrolled flight on March 31, 1903, in Waitohi, New Zealand, and on August 28, 1903, in Hanover, the German Karl Jatho made his first flight. The Wright Brothers are commonly credited with the invention of the aircraft, because theirs was rather the first sustainable and well documented flight. They made their first successful test flights on December 17, 1903, and by 1905 their Flyer III was capable of fully controllable, stable flight for substantial periods. Strictly speaking, the Flyer's wings were not completely fixed, as it depended on a flexing mechanism called wing warpingfor stability. This was later superseded by the development of ailerons, devices which performed a similar function but were attached to an otherwise rigid wing. Alberto Santos-Dumont a Brazilian living in France, built the first practical dirigible balloons towards the end of the nineteenth century. In 1906, he flew the first fixed-wing aircraft in Europe, the 14-bis, of his own design. It was the first aircraft to take off, fly, and land without the use of catapults, high winds, or other external assistance. A later design of his, the Demoiselle, introduced ailerons and brought all-around pilot control during a flight. Wars in Europe, in particular World War I, served as initial tests for the use of the aircraft as a weapon. First seen by generals and commanders as a "toy," the aircraft proved to be a machine of war capable of causing casualties to the enemy. In the First World War, the fighter "aces" appeared, of which the greatest was the German Manfred von Richthofen, commonly called the Red Baron. On the side of the allies, the ace with the highest number of downed aircraft was René Fonck of France. After the First World War, aircraft technology continued to develop. Alcock and Brown crossed the Atlantic non-stop for the first time in 1919, a feat first performed solo by Charles Lindbergh in 1927. The first commercial flights took place between the United States and Canada in 1919. The turbine or the jet engine was in development in the 1930s; military jet aircraft began operating in the 1940s. Aircraft played a primary role in WWII, having a presence in all the major battles of the war, especially in the attack on Pearl Harbor, the battles of the Pacific, and D-Day, as well as the Battle of Britain. They were also an essential part of several of the military strategies of the period, such as the German Blitzkrieg or the American and Japanese Aircraft carriers. Jet aircraft were first developed by both the British and Germans during this period. In October 1947, Chuck Yeager, in the Bell X-1, was the first recorded person to exceed the speed of sound. 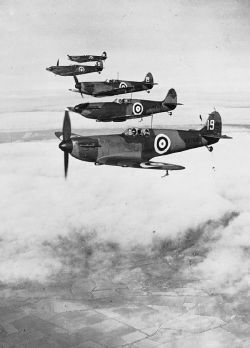 However, some British Spitfire pilots claimed to have exceeded Mach 1 in a dive. The Boeing X-43 is an experimental scramjet with a world speed record for a jet-powered aircraft—Mach 9.6, or nearly 7,000 miles per hour. Aircraft in a civil military role continued to feed and supply Berlin in 1948, when access to railroads and roads to the city, completely surrounded by Eastern Germany, were blocked by order of the Soviet Union. The first commercial jet, the de Havilland Comet, was introduced in 1952. A few Boeing 707s, the first widely successful commercial jet, are still in service after nearly 50 years. The Boeing 727 was another widely used passenger aircraft and the Boeing 747 was the biggest commercial aircraft in the world until 2005, when it was surpassed by the Airbus A380. Small aircraft can be designed and constructed by amateurs as homebuilts. Other aviators with less knowledge make their aircraft using pre-manufactured kits, assembling the parts into a complete aircraft. Most aircraft are constructed by companies with the objective of producing them in quantity for customers. The design and planning process, including safety tests, can last up to four years for small turboprops, and up to 12 years for aircraft with the capacity of the A380. During this process, the objectives and design specifications of the aircraft are established. First the construction company uses drawings and equations, simulations, wind tunnel tests and experience to predict the behavior of the aircraft. 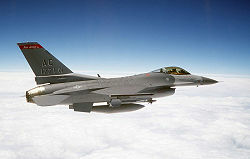 Computers are used by companies to draw, plan, and do initial simulations of the aircraft. Small models and mockups of all or certain parts of the aircraft are then tested in wind tunnels to verify the aerodynamics of the aircraft. When the design has passed through these processes, the company constructs a limited number of these aircraft for testing on the ground. Representatives from an aviation governing agency often make a first flight. The flight tests continue until the aircraft has fulfilled all the requirements. Then, the governing public agency of aviation of the country authorizes the company to begin production of the aircraft. In the United States, this agency is the Federal Aviation Administration (FAA), and in the European Union, Joint Aviation Authorities (JAA). In Canada, the public agency in charge and authorizing the mass production of aircraft is Transport Canada. Quieter aircraft are becoming more and more necessary due to the increase in air traffic, particularly over urban areas, as noise pollution is a major concern. The Massachusetts Institute of Technology and Cambridge University have been designing delta-wing aircraft that are 25 times more silent than current craft and can be used for military and commercial purposes. The project is called the Silent Aircraft Initiative, but production models will not be available until around 2030. There are few companies that produce aircraft on a large scale. However, the production of an aircraft for one company is a process that actually involves dozens, or even hundreds, of other companies and plants that produce the parts that go into the aircraft. For example, one company can be responsible for the production of the landing gear, while another one is responsible for the radar. The production of such parts is not limited to the same city or country; in the case of large aircraft-manufacturing companies, such parts can come from all over of the world. The parts are sent to the main plant of the aircraft company where the production line is located. In the case of large aircraft, production lines dedicated to the assembly of certain parts of the aircraft can exist, especially the wings and the fuselage. When complete, an aircraft goes through a set of rigorous inspection to search for imperfections and defects, and after being approved by the inspectors, the aircraft is tested by a pilot in a flight test, in order to assure that the controls of the aircraft are working properly. With this final test, the aircraft is ready to receive the "final touchups" (internal configuration, painting, etc. ), and is then ready for the client. Statistics show that the risk of an airliner accident is very small. Although large scale crashes result in hundreds of fatalities, a study of 583 airplane accidents between 1983 and 2000 showed that over 96 percent of those involved survived. However, most of these crashes did not involve large passenger planes. Large aircraft have a strong impact on the environment, compared with other commonly used vehicles. Their contrails contribute to global dimming and their noise is often significant. However, the most significant impact of such aircraft upon the environment is their contribution of greenhouse gases. Environmental groups and the airline industry make conflicting claims as to these effects. ↑ Milla Harrison, How to survive a plane crash. BBC News, October 3, 2006. Retrieved September 8, 2012. The Wings of the Web. www.airliners.net. This page was last modified on 13 February 2019, at 00:57.